This annotation previously appeared in Senses of Cinema, no. 19, 2002, and Issue 41, 2006. With: Claudia Cardinale, Werner Herzog, Mick Jagger, Klaus Kinski, Eva Mattes, Jason Robards. Herzog revisits the sites of Aguirre, Wrath of God (1972) and Fitzcarraldo (1982) on the Amazon tributaries of Peru and recalls the bombastic egocentrism that made Kinski the biggest problem with production besides the budgets. Kinski arrived on the locale of Aguirre fresh from a “Jesus tour,” arena appearances in which he played a raving saviour quoting great tracts of bilious gospel. He so identified with the role he continued to live in it as a derided, misunderstood Jesus, though what Herzog needed was a ruthless 16th century Spanish conquistador. To the set Kinski brought rages of “unimaginable proportions” prompted by any irritant – the food, mosquitoes, rain, or noise. When he forget his lines he would look for a victim to rage at who may have grinned or whispered at just the wrong time. One night the extras were cavorting and tippling after a long shoot, Kinski became so enraged he took a Winchester and fired three bullets into the tent of 45 men. By some fluke no one was killed, but he did shoot the fingertip off of one merrymaker. Any emergency on the set would marginalize Kinski – take him out of the spotlight – and prompt a rave. But Herzog would exploit Kinski’s propensity for mania. For Aguirre he would provoke Kinski to a rage and then shoot – the aftermath of Kinski’s frenzy was the ideal histrionic medium for “Aguirre’s madness.” The rages prompted the Campas Indian extras in Fitzcarrraldo to offer to kill Kinski. Herzog exploited their sentiment in a scene in which the Campas chief and his followers surround Fitzcarraldo and crew while they eat in the galley of their grounded steamboat. The chief harangues Fitzcarraldo/Kinski in a discomforting riot act veiled in his own language. Exploitation runs from film set to story since Fitzcarraldo also exploits the Indian myth of a white god who will deliver them from pain and death to enlist their labour in towing his steamship over a mountain. 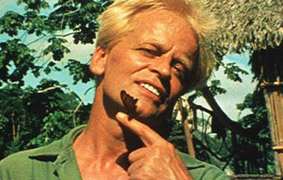 The wrath of Kinski stormed upon a blameless Herzog, innocent of everything but his venture, though it might bear considering that Aguirre opens at 15,000 feet in the Andean mountains on a slick vertical descent and the rest of the shoot is spent on Indian-made rafts cutting through solid jungle via the turbulent, opaque Urubambu River. And Fitzcarraldo does not simulate its task – an Amazonian steamboat was heaved up one side of a mountain and down to the river on the other, clearing jungle-density growth from its path. The 300-ton steamboat, cast and crew aboard, does flop on its side in the fierce rapids and rams into a rock face that bends its keel like a sardine can. All the while Herzog kept the camera rolling. Clearing a swathe of rainforest up the mountain face, a tree-cutter was bitten by a deadly chuchupe snake. With serum twenty minutes away and two minutes to cardiac arrest, he cut off his foot to contain the venom. Working for Herzog was a dangerous profession. What may be admirable in an exposé like My Best Fiend is that it shows the undertakings to be as dangerous as they were Herculean. In fact, the film improbably risks identification with Kinski over Herzog. Kinski was not good in an emergency, but he wasn’t complaining about a bad manicure. Five people flying to the remote location were critically injured when the plane crashed, a sixth paralyzed. An engineer quit the hauling project citing a seventy percent chance of catastrophe. The first Fitzcarraldo, Jason Robards, Jr., became so ill in Peru he had to be evacuated and was not permitted to return on doctor’s orders. A border war was pending with Ecuador that threatened Indian claims to the territory. Armies and oil companies were difficult to fight with bows and arrows but a film crew might make an easy target…. It took over four years to complete shooting from the first day of pre-production. Kinski’s tirades seem understandable when the catalogue of hazards and difficulties and the atmosphere of risk and angst are taken into account. In the rise and fall of the Amazon, Herzog saw a metaphor for their ups and downs, but more apt was Herzog’s relationship to the tropical jungle that he found to be “ferocious” with a “harmony of overwhelming and collective murder.” He didn’t hate the jungle though, but admired it. In fact, he loved it against his better judgment. To Kinski, Herzog offered films of that epic quality he aimed for back in Munich. In the grudge match between the two, it might be significant that the raves that so frightened the Indians had a tandem quality: they were not afraid of Kinski as much as Herzog because he was so quiet. It may be true after all: you’re your own best fiend. Antonia Shanahan is a M.A. student at New York University's Department of Cinema Studies.